I love making pizza at home. The first reason is simple and obvious: It’s DELICIOUS! The second reason: It’s way HEALTHIER than what you can get at most restaurants and pizza joints. Finally – the frugal frosting on my cost-effective cake – It’s CHEAP because you can use other leftovers as toppings. For example, I rummaged through the refrigerator for last night’s toppings and found: a half-jar of spaghetti sauce; two previously opened bags of shredded mozzarella cheese (how did that happen!? ); and some sliced ham and a partial wedge of parmesan, both of which were close to expiring. Really, none of my grocery budget went toward this dinner, yet it’s one of the few things my whole family enjoys eating. It was a hit last night, and it always is. 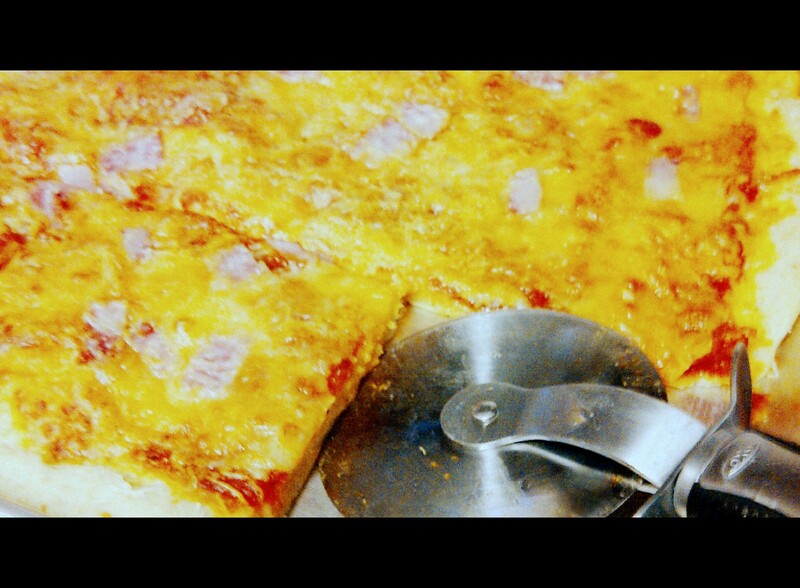 I’ve been making homemade pizza for about 8 years now. I love, love, LOVE this dough! It’s easy; it can be made in large batches and frozen for later use; and it can be made by hand, in the bread machine, or in a stand mixer. Pour warm water into a large bowl. Add sugar and yeast, stirring until dissolved. Add salt and olive oil, stirring again until dissolved. Stir in the flour with a large spoon. Sprinkle a little flour on your work surface, place your dough on the work surface, and knead for 3-5 minutes. Place the dough back into your bowl and set aside for 5 minutes. Chop and prepare your toppings. Preheat oven to 375°. Coat 13” x 18” pan with cooking spray and also spray some on your hands. Press the dough into your pan and top as desired. Bake for 20 minutes. This is my favorite option when I make a double batch. (I have the smaller Kitchen Aid model, the 4.5-qt size.) Using the dough hook on your stand mixer, add the ingredients in the same order as the Basic Recipe above, then bake at 375° for 20 minutes. There are no perishable ingredients in this recipe, so you can place your ingredients in the machine first thing in the morning, then have fresh pizza dough waiting when you’re ready to prep dinner! Follow your manufacturer’s directions for the order of ingredients. (My machine requires that wet ingredients go in first, followed by dry. I pour the water and oil into the bottom; cover it with the flour; make a well in the center of the flour for my yeast; and place the salt and sugar into opposite corners.) Select the pizza dough setting on your machine. 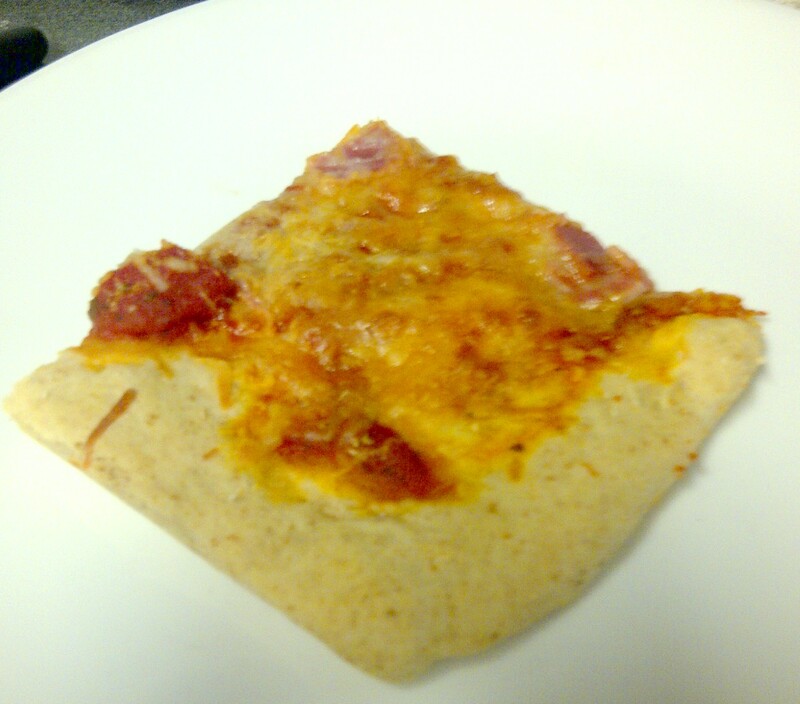 After the dough is ready, assemble and bake your pizza as directed in the Basic Recipe section above. Coat the inside of a plastic freezer bag with cooking spray. Shape dough into a ball, place inside the bag, and freeze. (The dough will still expand some.) When ready to use, remove from freezer and let thaw on counter for 2 hours. Then, assemble and bake as directed in the Basic Recipe section above. Enjoy! 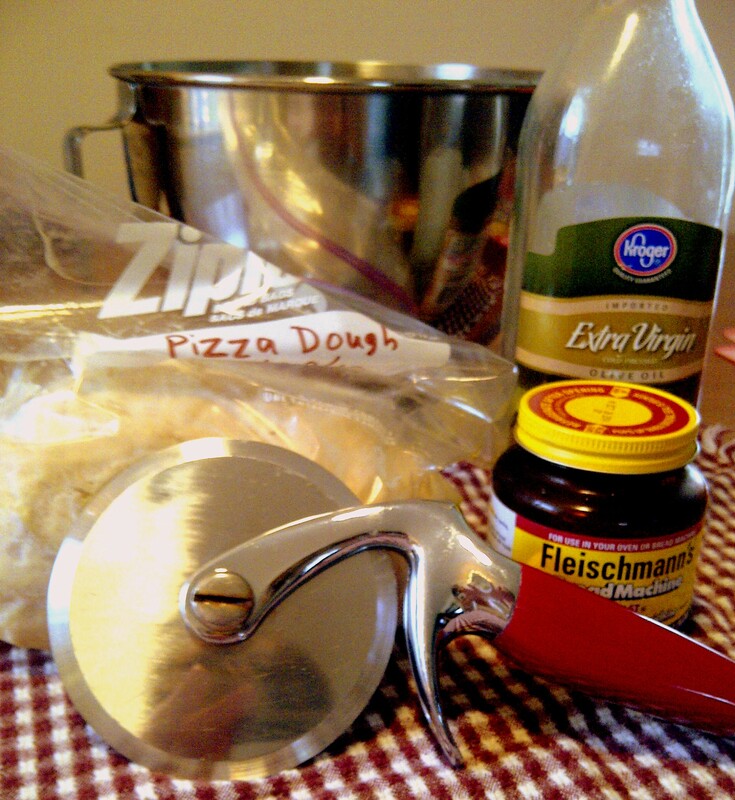 Next week on Foodie Friday, I will write about 5 other uses for this pizza dough.